Become a videogame-style villain, build a deadly dungeon, and crush puny heroes in this retro-inspired tabletop game! Take your dungeon to The Next Level with Boss Monster 2! Become one of twelve all-new Bosses, build deadly Trap and Monster rooms, cast versatile Epic Spells, and face new challenges like Hybrid Heroes and Dark Heroes. This all-new set of 160 cards plays as a standalone game or as an expansion to the best-selling original. This special limited edition features 14 holofoil cards, including the treasure-stealing Silver Dragon. 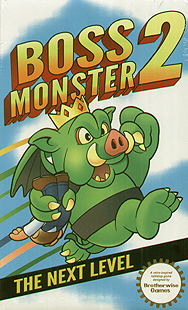 Boss Monster 2... Now you're slaying with power.